If you have a sunny location that has a heavy clay soil, you need to select flowers that will not burn under the hot sun and that can survive a soil that does not drain well. Heavy clay soils do not drain well. You have a number of options. Many annuals and perennial flowers can do well under full sun in a dense clay soil. Hydrangeas are very easy to grow. A hardy flowering plant, hydrangea in its many varieties can survive into United States Department of Agriculture (USDA) Hardiness Zone 3. The smooth hydrangea, or Hydrangea aborescens, is a 3- to 5-foot shrub that flowers from June to September and has been known to survive well in extreme northern Minnesota. Not all hydrangeas are shrubs. Some varieties are climbing hydrangeas, like Hydrangea anomala, which can reach 50 feet tall by climbing up tree trunks. Climbing hydrangeas, however, tend to be only cold hardy down to USDA Hardiness Zone 4. Black-eyed susans are late-season perennial flowers that do well in clay soils and thrive in full sun. They grow well in USDA Hardiness Zones 2 through 11, depending on the variety. There are a number of different cultivars, but most reach between 18 and 30 inches tall. Each daisy-like flower has yellow or orangeish yellow petals with a black center. Although black-eyed susans can grow well in clay soils, they do better in soils that drain well. They grow well in full sun, but can also tolerate some shade. Black-eyed susans grow in most parts of the U.S. The only places they do not grow well are northern Minnesota, northern North Dakota and northern Montana. Asters are hardy flowers that grow well in clay soils and full sun. Asters, depending on the variety, grow best in USDA Hardiness Zones 3 through 10. Asters grow to between 10 and 18 inches tall, depending on the cultivar. 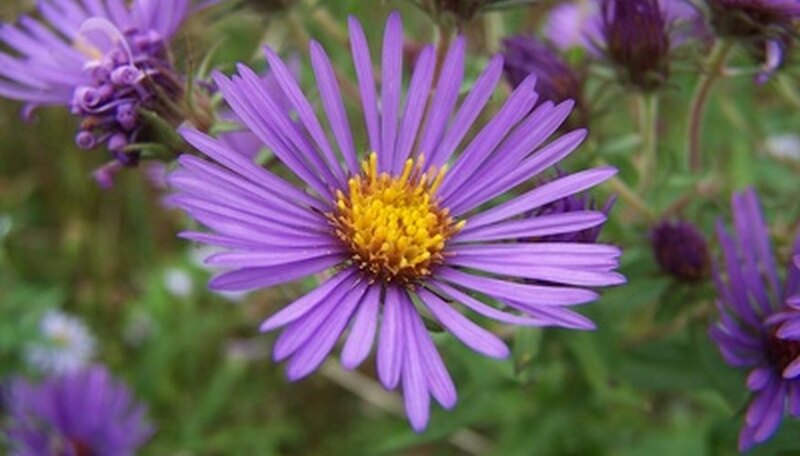 Asters have daisy-like flowers with yellow centers and blue, pink or purple petals. Some aster petals are fine and almost hair-like. Other aster petals are thicker and more daisy-like. Some varieties of aster, like Aster carolinianis, are climbing asters. Climbing asters are best in warmer climates and do well in USDA Hardiness Zones 6 through 10.